Vercingetorix kept his unbeaten record intact by a hair’s breadth in Saturday’s R1.5-million Daily News 2000 (Grade 1) at Greyville, just stealing the laurels from a charging Summerhill-bred No Worries. Capetown Noir, winner of the Investec Cape Derby, went through the stalls as the 18-10 favourite, with Vercingetorix an easy-to-back 28-10 in his toughest test to date and stablemates Yorker and Tellina next on offer at 7-1 and 15-2. Rock Cocktail led early from Yorker and Abercrombie with Wylie Hall, Vercingetorix and Silvano’s Jet next, ahead of Capetown Noir on the fence. No Worries was towards the back, followed by Patriotic Rebel, Tellina and Wild One. Yorker, taking the shortest route for home, challenged Rock Cocktail soon after the runners straightened, but jockey Anthony Delpech was winding Vercingetorix up and the Mike de Kock-trained colt led 200m from the line. Meanwhile Capetown Noir was also putting in a sustained finish and No Worries, who was caught flat-footed at the top of the straight, was finishing fastest with Wylie Hall on his outside. The line came just in time for Vercingetorix to hold on by a short head from No Worries, who might well have beaten Mike de Kock’s runner had he and Wylie Hall not made contact about 100m out. 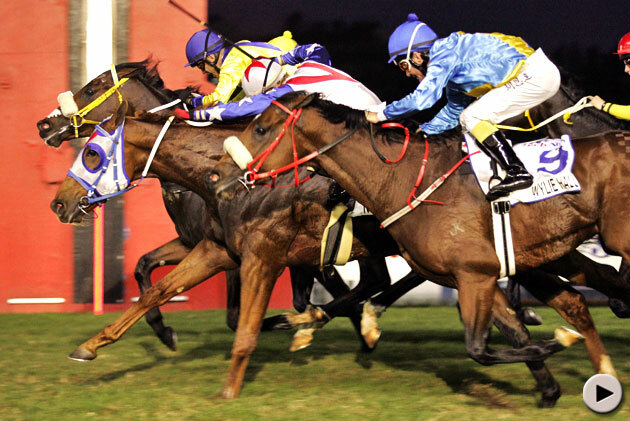 Capetown Noir got third, a head further back, with Wylie Hall the same margin behind in fourth. Rock Cocktail stayed on well for fifth, with Yorker fading late to 10th. He added that Vercingetorix is the horse “they’ll all have to beat” in next month’s Vodacom Durban July. Honours in the Woolavington went to the Triple Tiara winner’s “bridesmaid” Do You Remember, who beat Blueridge Mountain and Jet Belle by a head and the same margin, with Cherry On The Top, failing to produce her normal finishing kick, another two lengths back. Priceless Jewel went straight to the front to set a solid pace and at one stage, although she hung out on the turn, she had five lengths in hand over Blueridge Mountain, whose stamina was being thoroughly tested. Jet Belle raced on the rail alongside Geoff Woodruff-trained Do You Remember (jockey Bernard Fayd’Herbe), with Nonki Poo and Cherry On The Top racing side by side further back. Al Kindi and Jet Supreme brought up the rear. As the runners straightened Anton Marcus, showing no signs of discomfort from the operation he had on his thumb on Monday, allowed Blueridge Mountain to pounce and his mount was soon in the lead. However, she hung out, followed by Do You Remember and Jet Belle and the three surged forward in a line. In the end less than a neck separated them.